A news item this morning has me thinking about responsibility and free will. On Monday, Kaleb Langdale, 17, was swimming in the Caloosahatchee River west of Lake Okeechobee when an alligator bit off his arm below the elbow. Wildlife officers found and killed the alligator. They retrieved the arm, but doctors were not able to reattach it. "We found the alligator that was responsible." Really? Yeah, we know what he means -- but what he means isn't what he said. We don't hold reptiles responsible. We may try holding dogs and cats responsible -- which seems to work better for dogs than for cats -- and maybe, in a pinch, other mammals or birds -- but holding wild gators responsible is silly. the water after it was killed. Wildlife officers hunted down the poor creature and killed it. But this is not punishment or retribution or any other form of "holding responsible." 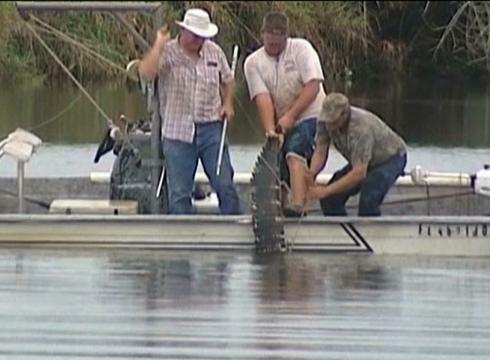 Aside from wanting to retrieve the arm, just in case it could be reattached, killing the gator is purely an act of preventive public safety, not punishment. We know that alligators who have attacked a human are more likely to do so again, so we remove the danger. Holland builds dykes to keep out the high water, but they don't holding the sea responsible for the flooding it may cause. Humans, on the other hand, we do hold responsible, by and large. When we administer the death penalty to humans (however misguided, ineffective, and actually counterproductive this may be), it is a part of our practices of holding responsible. Why do we hold humans, and not flood waters or wild critters, responsible? Sometimes we explain this by saying humans have free will, and the other beings or things don't. This has never been a very good explanation, and lately it has been getting worse and worse. On the human side, brain science is discovering more and more conditions "beyond the person's control" that cause erratic behavior. Take, for example, the 1966 shootings by Charles Whitman at the University of Texas. He killed 13 and wounded 32. It turns out Whitman's brain had a tumor the diameter of a nickel. In what sense can Whitman be said to have "chosen" to shoot the people he shot? The right sort of tumor in the right sort of place, and any one of us will feel an overwhelming compulsion to violence. And on the nonhuman animal side, we have been learning that the decision-making circuitry in animal brains is so similar to ours that if there's "free will" somewhere in the human brain, then it's also there in any mammal -- and, basically, any vertebrate -- brain. Either because humans don't have free will, or because, if we do, then other animals have it, too, it won't work to say Charles Whitman had free will but the gator that bit Kaleb Langdale didn't. "Free will" is a conceptual quagmire, and if our institutions of responsibility-holding depended upon free will, then those institutions wouldn't stand. Fortunately, they don't depend upon free will. The practices of holding each other responsible stand on their feet. Whether you have free will or don't, it turns out that holding you responsible for your actions influences those actions in socially salutary ways -- sometimes. Not always: no amount of moralizing would have fixed Charles Whitman's brain or restrained his behavior. But the practices of holding responsible are effective enough, on enough of us, to make those practices worth keeping around -- again, whether we have free will or not. So the legal system in 1966 held Whitman responsible -- and we don't hold wild gators responsible -- because holding the human responsible is a part of our imperfect but better-than-nothing system for regulating our conduct with each other. With humans, we presume that the rhetoric of responsibility will find some purchase (even if we know that every once in a while it won't). With wildlife, though, a concept of their responsibility is not helpful in guiding our relations with them.